Theoretically, Overcooked 2 is a multiplayer game. But let's be real, with games like Overcooked, friends are hard to keep. Maybe you yelled one too many times at your fellow chefs. Maybe you may just want a solo experience in the oven after a long day in the fire. For every more introverted chef out there that wants to serve up meals on their own, Ghost Town Games actually provides a pretty enjoyable solo experience in Overcooked 2. Instead of programming an AI to frustrate the player, the game lets solo users switch from chef to chef, controlling both simultaneously. That means one chef can boil rice and clean dishes while another chops up tomatoes. If you're feeling a little overwhelmed by Overcooked 2's single-player mode, don't worry. You still have a friend in us. For all the lonely cooks out there, here's our tips and tricks for solo players eager to learn more about Overcooked 2's campaign and single-player mode. To be blunt, Overcooked 2 is tough with friends. It's even harder on your own. Chances are you're going to mess up orders pretty quickly once they become complicated, especially on those secret Kevin levels. Ghost Town Games compensates for this by lowering the score requirements for solo players. It's easier to land a three-star rating, because users playing the game on their own don't have to send out as many orders. So don't compare your single-player performance to multiplayer's hectic game modes. By design, the game doesn't expect you to plate dozens of meals before the timer runs out. At first glance, it can be hard to memorize new recipes on the fly. 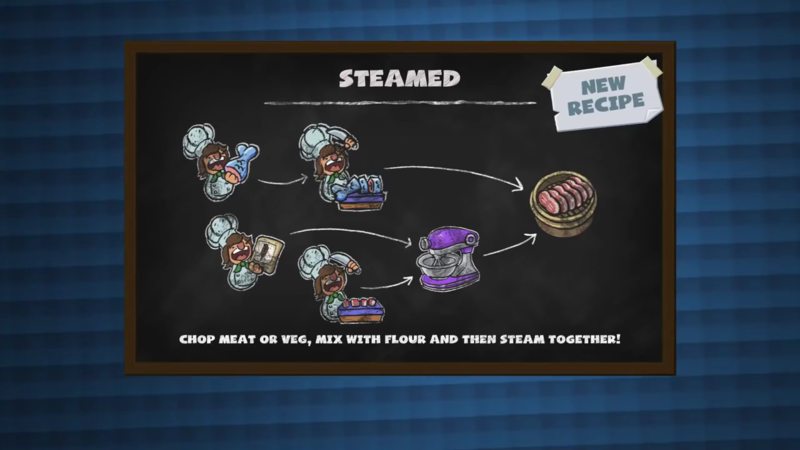 Cooking up steamed meat and fish, for example, can get messy on Kevin 1, leading to broken plates and broken combos. Even simple recipes like pasta or salads can be mixed up fast if you find yourself momentarily distracted, like a pot on fire. Without another player to guide you, single-player can become a food fight in its own right, especially when your pasta is boiling over and you're stuck washing dishes. If you boot into a level and immediately feel confused by how to handle a new recipe's preparation, don't be afraid to restart and review the meal's step-by-step diagram. Overcooked 2 does a pretty good job of showing players how to put together an order when it's first introduced. So when in doubt, go back to the cook books. 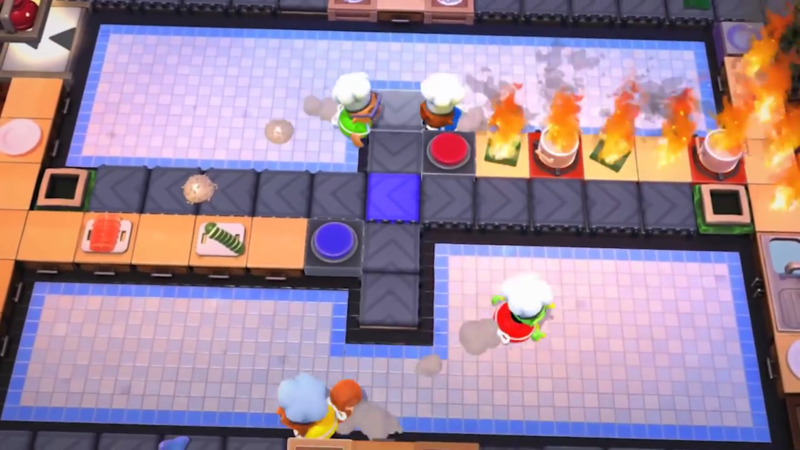 Normally in Overcooked 2, players communicate on the fly as they serve up dishes, simultaneously pointing out problems in the kitchen while giving each other status updates. Things are different in single-player. There isn't another person to help you cook in the kitchen, which means you'll be handling every single part of meal preparation. From the beginning to the end. That's can be a good thing, like Jon Favreau in Chef you've become your own boss. At all times, you know what's going on in the kitchen, so you can plan out how to address meals and create a plan of action for tackling larger issues. Start figuring out which actions need a chef's attention and which ones don't. 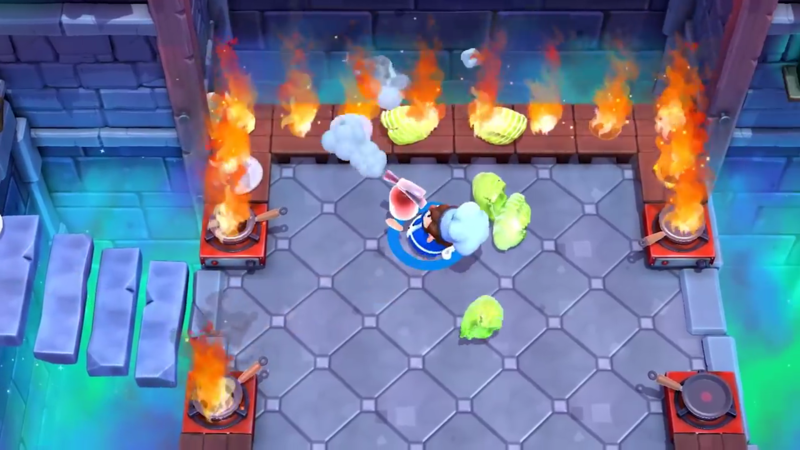 Boiling, frying, and steaming food doesn't require the player to actively stay at the cooking station in question, so players can run around the map and complete other tasks while they wait for the boiling water to finish its job. In other words, Chef #1 can chop cucumbers while Chef #2 simultaneously boils pasta and washes dishes, making the kitchen a much more efficient operation. 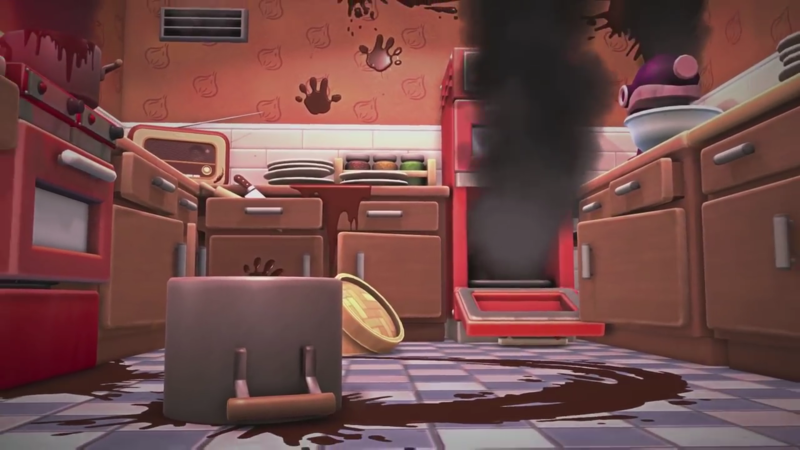 Overcooked 2 makes solo players take control of both chefs in the kitchen. It's pretty overwhelming at first, but it doesn't have to be. If your salad and hamburger orders are out of control, consider assigning chefs to stations and keeping them there at all times. For instance, on Level 1-4, the player must put together fish and cucumber sushi recipes by moving around a kitchen with two conveyor belts running in opposite directions. Because space is narrow in the middle and wide near both the boiling pots and kitchen sink, it's best to make one chef chop ingredients and another to boil rice. You can delineate additional tasks to each chef. The chef who chops ingredients may be responsible for adding seaweed to plates, because no additional preparation is required. Meanwhile, the chef who boils rice may clean dishes too. By assigning tasks to certain chefs, you can keep the kitchen running smoothly. So when things inevitably fall apart, order remains and meal combos can be maintained. Let's say you actually have friends (nice work), but you find yourself constantly slipping up while playing Overcooked 2 with your pals. 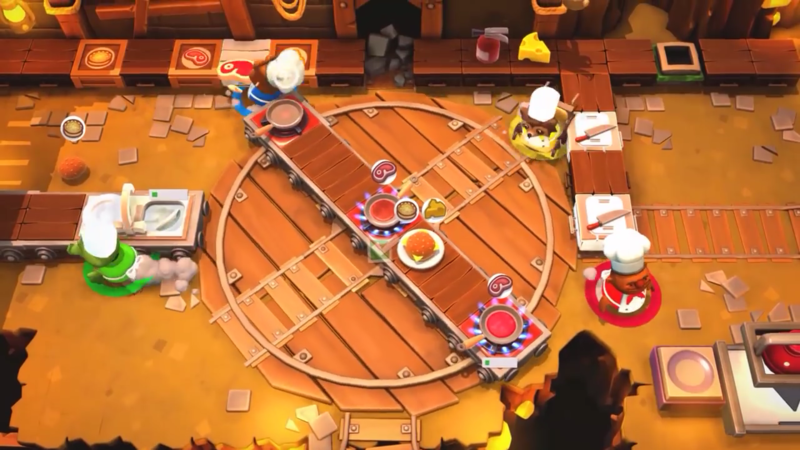 One of the best reasons to play Overcooked 2 in single-player is to practice the game's recipes and perfect your actions so your reflexes are set for the real co-op fun. Sharpen your skills like a good knife, to show off when you do rejoin cooks at large. Don't be afraid to boot up levels across the game and run through them, making, remaking, and re-remaking orders constantly to reach the highest score possible. While Overcooked 2 is well designed, its controls can take getting used to, so spending time with the game and learning its minutia can iron out newcomers struggles like a dirty apron.